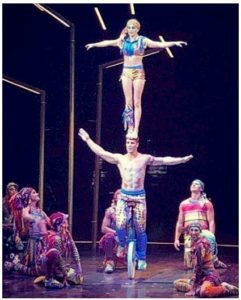 May 16, 2018: The new big top show from international entertainment behemoth Cirque du Soleil, Volta, with an energy-jolting focus on space-age extreme sports, plays Long Island May 17 – July 1. Its new eco-friendly white and grey “grand chapiteau” has risen adjacent to NYCB Live/Nassau Veterans Coliseum in Uniondale. The show is so colossal it took 16 creators to assemble it. 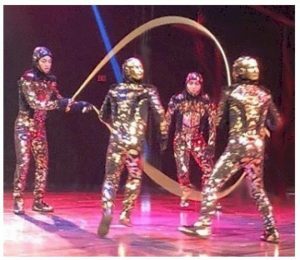 The show stars a cast of international athletes who provide the adrenaline rush of jawdropping acrobatics against the visually striking production, driven in the tried-and-true Cirque tradition by a pulsating score. The band is under music director and international electronic composer Anthony Gonzalez, of the French band M83. Vocalists are Darius Harper and Camilla Bäckman. Julie Perron (Cirque’s Delirium, Viva Elvis, and Wintuk). is choreographer. Rob Bollinger and Philippe Aubertin are the acrobatic performance designers. The story-line follows Waz, a game show contestant who’s lost touch with himself. He goes on the show in search of fame, thinking that will bring him love and acceptance, but finds fame isn’t the answer. Was begins a personal quest to find his true self. Along the way, he’s encouraged by an amazing group of free spirits to help him recognize the power to make it possible. Among those that make his journey extraordinary are unicyclists, roller skaters, precision tight rope walkers, military-style parkour [running, climbing, swinging, vaulting], BMX (bicycle motocross) daredevils, a woman swirling through the air suspended by her hair, Swiss ring and bungee artists, shape divers [sailing through gymnastic hoops and rings), and one of the most incredible acrobatic ensembles in Cirque’s history. 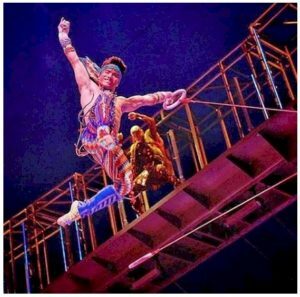 A highlight of every Cirque show is the costuming and the designs of acclaimed Emmy-winning Filipino-American fashion designer Zaldy (Goco) (Cirque’s Michael Jackson ONE, RuPaul’s Drag Race, Lady Gaga’s Monster Ball) may be the most colorful and daring of their 41 original productions [since 1984]. 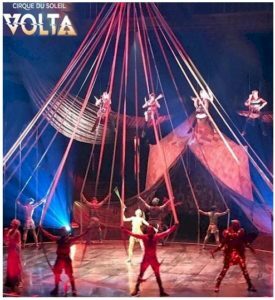 Cirque du Soleil’s Volta standard admission tickets are $55 – $275 depending on location and date, and available at www.cirquedusoleil.com/volta or by calling (877) 924-7783) [service fees apply]. Tickets for children, 2 – 12, are $45 – $82; seniors, students, and military, $50 – $87. Parking is $25. A Family Pack is a reduced-price option for four or more. To go behind the scenes, there’s the VIP package, which includes cocktail reception/open bar, hors d’oeuvres, premium seats, private terrace for interval refreshments, gift bag, and parking. For more information, visit www.cirquedusoleil.com.